Military Documents provide the record of achievement for every soldier. SFC David Hack, USA (Ret) has elected to publish his Military Documents which testify to his record of achievement serving the United States Army. Statement of Creditable Service & DD214. Click to view (will open in a new window). Medals, including Purple Heart (1968) and Good Conduct (1973). Click to view (will open in a new window). DA873 Certificate of Clearance and/or Security Determination. Click to view (will open in a new window). 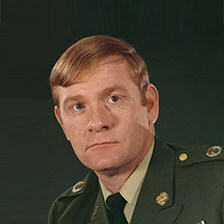 Promotion from SSG to SFC, March 30 1973. Click to view (will open in a new window). Disability Retirement, DD3713, July 1973. Click to view (will open in a new window). USCG Documents for the US Army, 1964. Click to view (will open in a new window). Dept. of the Army Case Management Letter regarding correction of Sgt. Hack’s military record to show the correct retired rank of SFC. Click to view (will open in a new window). *Sgt. Hack’s military records are on file with The National Personnel Records Center, 9700 Page Ave, St. Louis MO, 63132-5100.